Remember this lace dress that I dyed, cut, and reconstructed? It's been some time since I've worn it and given it fashion love without having to wear loads of layers combined, all due to colder climates. I decided to wear my lace with a sport jacket this time to give what would typically be a casual and sportier look, a bit more polish than normal. The jacket is made of sweatshirt material, which also had a baseball patch of some sort, but I added my own crest patch atop, giving it a personal touch. I mean let's face it, I love sport, however I have not the slightest clue on what's happening in baseball at the moment! I just know that I like the jacket, the striped ribbing along the neckline, and tan colour ... that is all! For some reason, sporting my own fictitious team (crest embellished and all), seemed perfectly suitable! How was your long weekend, did you do anything spectacular? To be honest, I probably had the best restful weekend. I ate well, and laughed so much that my abdomen had a full workout on its own, and even managed to get some sketching done in my handy "ideas" notebook. It was nice to be around friends and loved ones, especially when they bring nothing but smiles to your face! In short: a grand way to start off a new week. I suppose, the only thing to top it off would be to go vintage shopping! The goods: Jacket-c/o Oasap, Dyed lace dress-DIY, Black underskirt-Ladyofashion, Shoes-BDG via Urban Outfitters. I really like that combo! I love the jacket and how you've added the patch to it. I absolut LOVE this look!!!! IT#s stunning! That's a pretty lacy dress - clever the way you have reconstructed it and adding the cardi definitely gives it a casual look. We had a long weekend here too but yesterday it poured down from start to finish. A good excuse to be indoors shopping! Thank you so much for your lovely comment on my Istanbul post. That jacket is so cute with that dress! what a cozy jacket! i love the look...masculine and feminine at the same time! You look so chic babes, I loveeeeeeeeeeeeeeeeeeeeeeeeeeeeeeeeeeeeeeeeeeeeeeeee your shoes. Your styling and mix of trends is always exceptional, love the preppy, pretty sporty blend of great pieces, brought together with charm and grace. hey madison! i love the sporty and lace combination. it looks great together. quiet weekends can be really nice. a great way to gather your thoughts and re-group. mine will probably be like that this weekend coming up. have a great week doll. I really love your varsity jacket! It looks great against the ultra feminine dress! I love the touch of prepster hip in this outfit, Madison! And your boots are to die for! What a sweet look! I really love the way you added the sporty jacket over the dress you reconstructed! Love the new look of the lace dress!!! Impressive DIY!!! i used to have jackets like these...wish i kept them! cute mix here. i had a chill weekend, too. ate way too many hot dog, tho! I like the way you mixed a cute dress with a varsity jacket ! You look really, really cool! That jacket is awesome! Thanks Kim. Yes, I do hope you can get some nice rest and quiet time this weekend. Ahh, you're very welcome dear. Always a pleasure to read your posts. Thanks so much for your sweet comment. Yes, we had bank holiday at work, and also memorial day for some as well. Love that you added your own crest on the jacket--great way to personalize. And it looks great with the shoes too. Hi dear, thanks for sharing your fashion verdicts with me~! That jacket is kind of amazing. you look awesome! What a great combination, Madison! 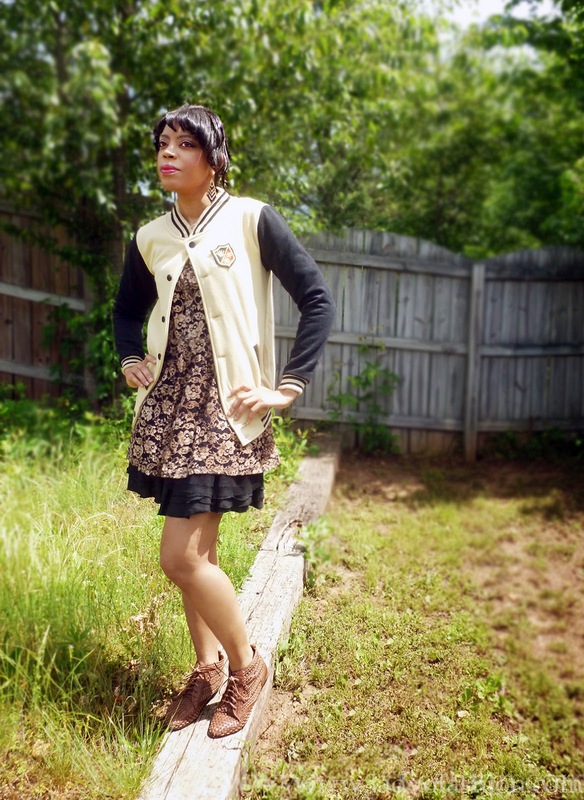 What I love about it is how absolutely unusual the pair of a lace dress and baseball jacket is, and yet, how effortlessly they come together in your outfit. Absolutely beautiful! Love this chic mix of textures! 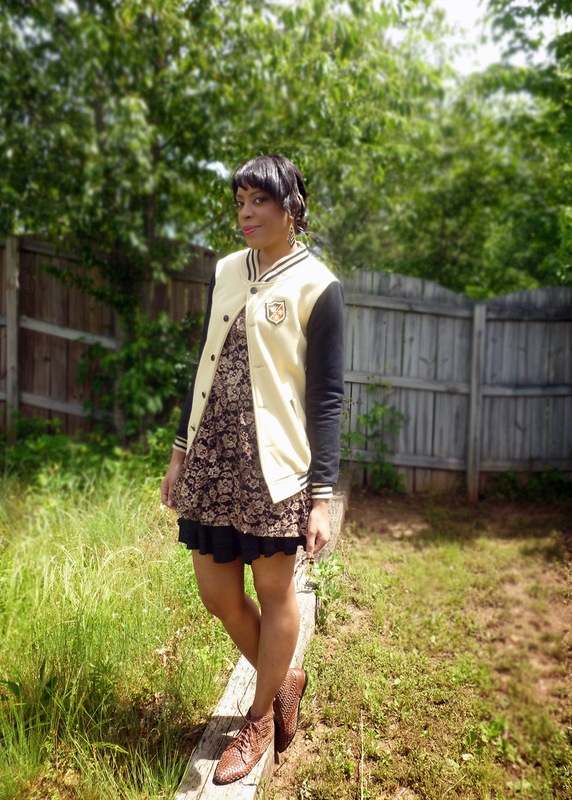 Love the lace dress and the preppy varsity jacket! Hope you are having a wonderful day! I like what you said about the jacket and baseball! I like how you got together lace and a sport jacket. I love that you added your own crest to the jacket - such a great idea and it looks awesome! Thank you so much! :) Do try it!